MaxFactor foundation; this was my favourite back in 2013 but for some reason I completely forgot about it and erased it from my make-up collection. I'm so glad I finally re-purchased it! It is so light weight yet it gives plenty of coverage!! It also gives a really nice finish and I am very happy about it. Miley Cyrus Viva Glam Lipglass by MAC, Having been a massive Miley fan I thought it would be right to buy her Viva Glam. I really love the lipglass it is super sparkly and it stays for a long time! My beauty favourite is going to be Zoellas Soak Opera, I used it both as a shower gel and a bubble bath and absolutely love it! I love the smell as it is very subtle and I love the bottle, it just looks so pretty! Gabrielle Aplin album English Rain, I have been a massive fan of Gabrielle for such a long time and the fact it is two years later and I'm still loving her album says a lot, it is such an easy listen!! I can't wait for her next album!! 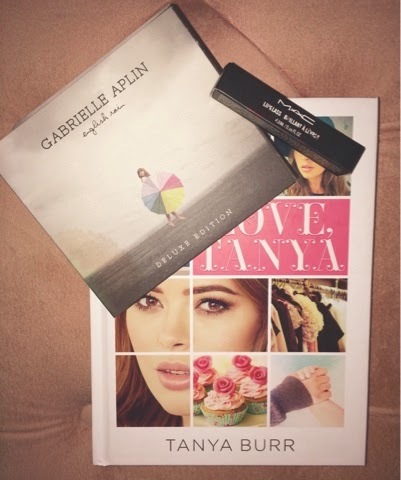 Tanya Burr: Love Tanya has to featured, I feel if you are not a fan of Tanya the you would still love this book, there are so many tips and ideas and I really like the fact she has left spaces for us to write!!! It's a must have and would recommended to any beauty lover!! Lastly I'm going to say Almonds, I go through stages of food obsession and right now it's chopped almonds!! Let me know in the comments what your February Favs are? !